ACT I The scene is London in 1837, a few days before the coronation of Queen Victoria. In Soho, one of the city’s seamier sections, business is as usual: Beggars are begging, thieves are stealing, whores are whoring. A ballad singer gets the crowd’s attention with his song about the exploits of the most influential criminal citizen in the city, Macheath (“Ballad of Mac the Knife”). A man separates himself from the crowd and quickly crosses the square. It is Macheath himself. Elsewhere in the square dwells Jonathan Jeremiah Peachum, whose sense of philanthropy has caused him to open a shop where – for a whopping price – the poorest of the poor can acquire an exterior that will touch the hardest of hearts. In short, Peachum is a kind of uncrowned king of London’s beggars, and he sees no point in mincing matters with his patrons (“Peachum’s Morning Hymn”). Peachum’s business, then, is arousing human sympathy, and he deplores the fact that his “effects” can lose their effect because man can “deaden his feelings at will.” A young man named Filch enters the premises of Beggars’ Friend Ltd. Filch has been caught poaching on Peachum territory and has been flogged for his impudence. Possessor of only a few shillings, he seeks a license to beg in one of Peachum’s fourteen districts, but the honorable Mr. P. demands a pound. They strike a deal: Ten bob plus fifty percent of Filch’s take – with outfit, seventy percent. Peachum then presents outfits for the five basic types of misery, “those most likely to touch the human heart.” Mrs. Peachum, the good Jonathan’s lady, adds some fine touches of her own to the costume, as husband and wife discuss the future of their daughter, Polly. A certain Captain has been observed meeting Polly behind Peachum’s back. Mrs. Peachum is delighted with the Captain’s courtly attention to her daughter and herself. Peachum is disturbed because he doesn’t want a daughter married, since, as he informs his wife, “she can’t hold her tongue in bed any better than you.” Besides: “I expect my daughter to be to me as bread to the hungry.” Then he tells her who the Captain really is: Mac the Knife! And she is horrified! Peachum checks Polly’s room. Her bed is untouched. Mr. and Mrs. Peachum then bemoan the romanticism of the young – who are so easily smitten by the moon over Soho – “’No They Can’t’ Song”. Meanwhile, deep in the heart of Soho, Mac the Knife prepares for his marriage to Polly. With fellow-crook Matthew, he inspects a bare stable. Polly is upset at starting her married life in a stable, but Mac assures her that “the trimmings will be here in a moment.” As if by magic, half a dozen of the gang rush in carrying stolen carpets, furniture, dishes, etc., transforming the stable into a luxurious room. Macheath is furious that there is a harpsichord (only half on hour ago, it belonged to the Duchess of Somerset) but there are no chairs. Off must come the legs of the harpsichord. The burglars set to work, singing as the go (“Wedding Song for the Less Well-off”). A wedding supper, complete with table laden with fine china and sliver and delicious food, next makes its appearance. A beggar runs in with the news that High Sheriff of London, Tiger Brown, is about to visit the wedding party. The bandits try to hide as Brown enters, but there is no need to, since Brown and Macheath are old Army buddies, having served in India together. They relive a few moments of the past (“Cannon Song”). Macheath toasts Brown, for the friendship that has been profitable to both. “Seldom have I, the humble bandit, made even the smallest haul without giving him, my friend, a sizable share as a gift and token of my unswerving loyalty. And seldom has he staged a raid without sending me, his boyhood friend, little tip-off.” Brown assures Macheath that Scotland Yard has no record of Mac’s misdeeds, then takes his leave. The time has come, thinks Macheath, for softer sentiments, so he dismisses his crew and is alone with Polly. They sing their own love song (“Liebeslied”). Back at Peachum’s outfitting establishments for beggars, the Peachums are aghast that Polly has married Macheath. Polly explains (“Barbara Song”) that a girl’s emotions sometimes don’t let her say “no.” Mrs. Peachum informs Polly that Macheath has several “wives.” Then, after Polly has left, Peachum and Wife conspire to turn Macheath over to the law for hanging. “That’ll earn us forty pounds,” they exult. “Only we’ve got to find out where he’s holed up.” Mrs. Peachum knows: “He’s holed up with his tarts.” But Mrs. Peachum reminds her husband that “money rules the world. I’ll talk to the girls.” Polly has been eavesdropping and assures her Mama that even if Macheath did have to go to the Old Bailey, the sheriff would serve him cigars and a cocktail because they’re boyhood friends. But Peachum is firm: Before the week is out, Macheath will be taken to the gallows for having committed his many crimes. “For the villainy of the world is great,” he maintains, “and a man needs to run his legs off to keep them from being stolen from under him.” It is time for the “First Threepenny Finale” as Polly and Mr. and Mrs. Peachum express their thoughts about the condition of the world (“Concerning the Insecurity of the Human State”). ACT II At the stable, Macheath is joined by Polly, who warns him of her parents’ plan to have him hanged. Polly bears a list of charges that have suddenly been lodged against Macheath: “You’ve killed two shopkeepers, more than thirty burglaries, twenty-three holdups, arson, attempted murder, forgery and perjury – all within eighteen months.” Worse luck, Brown says he cannot now help Macheath. There’s only one thing to do: Macheath must flee. He leaves his business for Polly to attend to, promising that soon he’ll enter the safer and more profitable banking business. Polly pleads with Macheath not to forget her, and he promises that “love will endure or not endure, regardless of where we are.” The two take their leave of each other (“Polly’s Lied”). Mrs. Peachum has now approached Low-Dive Jenny to turn Mac the Knife over to the constables, but Jenny expresses some doubt that this can be so easily done. Nonsense, says Mrs. Peachum, for she knows Macheath is not the kind of man to give up long-standing habits (“Ballad of Sexual Obsession”). As the whores sit around their establishment, Mac suddenly appears, acting like the lord of the manor. With scorn, he throws the warrant for his arrest on the floor. Jenny reads his palm, and sees a woman’s treachery. “When the Coronation bells start ringing at Westminster,” she warns him, “you’ll be in for a sticky time.” Then Jenny reveals a more sinister side to her personality as she fantasizes her revenge (“Pirate Jenny”). Inside the house, Mac swears his good fortune will never make him forget the companions of his dark days, “especially Jenny, whom I loved the best of all.” Jenny has now informed on Macheath to Constable Smith, and she and Mrs. Peachum watch the house. Then Jenny enters to join Macheath in remembering the old days (“Ballad of Immoral Earnings”). She and Macheath are still dancing together when Constable Smith makes his arrest. Mac escapes from Smith and jumps out of a window – right into the clutches of Mrs. Peachum and constables. Mac the Knife is led away to prison. At The Old Bailey, Tiger Brown hopes that his men have been unable to capture Macheath. He is shocked when six constables enter with Macheath in ropes, but Macheath refuses to speak to Brown. From behind the bars of his cell, Macheath muses about the good life he has had (“Ballad of Gracious Living”). Lucy, Tiger Brown’s daughter now enters in a fury: She has heard about Polly Peachum. Pregnant Lucy wants Macheath to make an honest woman of her. Polly has come to see her “dear husband” and the two women spitefully turn on each other (“Jealousy Duet”). Mrs. Peachum comes to the jail to retrieve Polly, and Macheath is put on the spot. His dilemma: to choose Polly or Lucy. Well, Lucy is Tiger Brown’s daughter. So a weeping Polly goes home, and Mac tries to soothe Lucy’s feelings. He tells her he must go into hiding but will send for her. She gives him his hat and cane, and Smith enters Macheath’s cell to take them away. There is a tussle, and Macheath is off and running. Hearing a commotion, Tiger Brown rushes to the scene, but too late. Mac has gone. Brown stands disconsolately in Macheath’s cell, where he is discovered by Mr. Peachum, who has come to collect the reward for “the capture of the bandit Macheath.” Peachum reminds Brown that Macheath’s escape – especially so close to the Coronation – might be held against Brown by both the authorities and the populace – not altogether a fate to be looked forward to. Brown is terrified into action. For the “Second Threepenny Finale,” Macheath, Jenny and Mrs. Peachum ask a burning question (“What Keeps Mankind Alive?”). ACT III At Peachum’s shop, the beggars have gathered for the last-minute instructions on disrupting the Coronation. A group of whores headed by Jenny arrives to collect the fee for the turning in of Macheath. An indignant Mrs. Peachum informs them that “your fine Mr. Macheath has scattered himself to the four winds” and suggests the ladies show themselves the door. Jenny defends Macheath as a true gentleman and lets slip the fact that only this morning she has been with Macheath before he went to see Suky Tawdry “to comfort her, too.” Mr. Peachum quickly dispatches Filch to the nearest police station, and then promises to pay the ladies. Filch returns almost at once. He didn’t have to go to the police, for the police have come to Peachum: Tiger Brown and his constables burst in. Brown threatens to take all the beggars present into custody. Peachum warns him (“Song of the Insufficiency of Human Endeavor”) that while Brown’s plan was brilliant it is not realistic – that the police will have to club down hundreds of other beggars and cripples in front of Westminster Abbey. And how will that look at the Coronation? “You can behave as you please to the Queen of England,” says Peachum, “but you can’t tread on the toes of the poorest man in England, or you’ll be brought down, Mr. Brown.” Peachum then gets Jenny to tell where Macheath is hiding, and Brown and his constables leave to make their arrest. Jenny then moralizes on the inadvisability of standing out from the crowd (“Solomon Song”). In his death cell, Macheath tries to bribe Constable Smith but is desperately without enough cash (“Call from the Grave”). Even Polly, who comes to see him, can’t help Macheath, for she’s put all their money in a bank at Manchester. She bids him a rather casual good-bye. Brown admits the crowd waiting to see Macheath die – Peachum, Mrs. Peachum, the whores, but only two members of the gang. Macheath and Peachum are introduced at last. Macheath’s gang can’t come to see his execution because “you see, a Coronation doesn’t happen every day. They’ve got to make some money when there’s a chance. They send their best wishes.” Macheath bows to the inevitable: He must die (“Ballad In Which Macheath Begs All Men for Forgiveness”). At the gallows, Peachum addresses the audience directly: “Since this is an opera, not life, you’ll see justice give way before humanity.” A royal messenger rushes to the gallows (“Third Threepenny Finale”). The Queen has pardoned Macheath and even raised him to the peerage, with a pension for life of ten thousand pounds. The saga of Macheath ends with the thought that one shouldn’t punish wrongdoing too much. 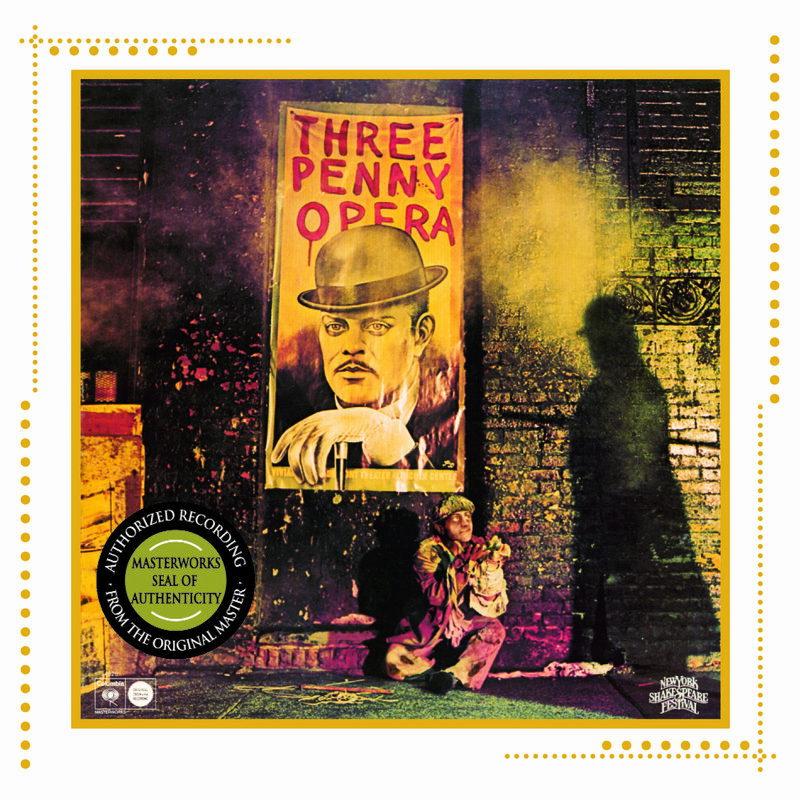 And so The Threepenny Opera ends as it began, with the Ballad Singer having the last word (“Ballad of Mac the Knife”).